Yes, you too can dazzle your family with amazing cuisine! Enter your email address to follow this blog and receive notifications of new posts by email. Unh, unh, unh! You can Link and Credit but no Stealing! Recently, on the way home from an amazing North Georgia mountain vacation, I stopped to pick up some Georgia peaches. They’re amazing when you get them right from the source: juicy, full of flavor, sweet and tart simultaneously. It was a sad day for me when the last two peaches shriveled a bit and didn’t invite me to devour them. Not one to waste good food, though, I took my paring knife and trimmed back the skin, only to find some beautiful fruit just below the surface. “This would be great for a recipe,” I ever-so-cleverly thought to myself. I was right! Well, this seems interesting. After a quick internet search for peaches and pork chops, I realized I didn’t exactly have everything for any of the recipes. Determined to not have to run to the store, I improvised. “I’ve just gotta say this, Joan, this is the best meal you’ve ever made. This might even be my favorite thing ever! Gimme some more!” She went on, but I’ll stop there. Must remain humble. Now, how can I ever beat that? In a bowl, I combined 1 chopped, slightly-overripe, peeled Georgia peach, 1/4 cup olive oil, 1/3 cup white wine vinegar, ½ cup brown sugar, juice of one-half lemon, 2 heaping tablespoons Dijon mustard, 1-2 tsp Iodized Sea Salt, 1 tsp ground black pepper, and a few shakes of spices like coriander, ginger and turmeric. I placed the pork chops in a glass baking dish and poured about 2/3rds of the marinade over them, reserving the rest in the refrigerator for later. I turned the chops over to be sure both sides were covered in marinade, then covered the bowl and refrigerated for a couple of hours. When it was time to cook dinner, I put some water on to boil for my so-easy Jasmine rice. Then I chopped the onions and peppers in large chunks (about 1”) and sautéed them in enough olive oil to cover the bottom of a fry pan. When softened and the onions turned gold, I added the other peach (peeled and chopped, remember, I had two left), then the reserve marinade from the refrigerator. I let this marinade cook down most of the way. The water was boiling by now so I placed the rice bag in that pan. Too easy, right? Next, I placed the onions and pepper mixture into a bowl, added more olive oil to the pan and heated it up. I removed the pork chops from their marinade (reserving the marinade) and placed them into the sizzling pan. While they cooked I opened the two cans of green beans (fresh may have been better but this is what I had), drained them and put them in a ceramic baking dish. In a small sauté pan, I melted about 2 tablespoons of Irish butter and sautéed about a palm-full of slivered almonds just to heat, not burn. I folded this in to the green beans, along with a sprinkle of salt and pepper and a shake or two of dried onion flakes from the cupboard. 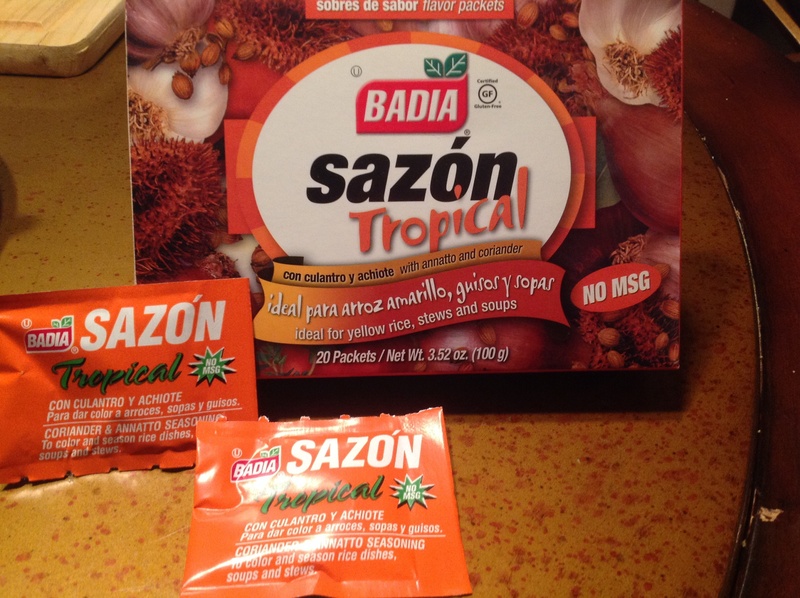 Not finding any cream-of-anything soups in the pantry, I decided to skip a sauce, and just layered the fried onions (by the way, those Fresh Gourmet Garlic Pepper Crispy Onions are amazing and make all the difference) atop the beans. I put them in the oven turned to broil and set the timer for 5 minutes. Returning to the pork chops, it was time to turn them. Depending on how thick they are, I estimated about 5 minutes a side, but check for temperature with a meat thermometer before deciding they’re ready. As they neared completion, I added the remaining marinade to simmer together heartily. By now the rice was ready to drain. I laid the rice in a large shallow serving dish near the stove. The green bean casserole (checked regularly to be sure it wasn’t burning) got a stir and went on the table. When the pork chops were ready, I added the onion, pepper and peach mixture back to the pan to heat them all back up together, then placed the pork chops on the rice and spooned the glorious sauce with the onions, peppers and peaches all over the pork chops and rice. Served with pumpernickel bread and more of that Irish butter, well, you can imagine. Winner Dinner. For a variation, try grilling the pork chops and cooking all the marinade with the onion, pepper and peach mixture. 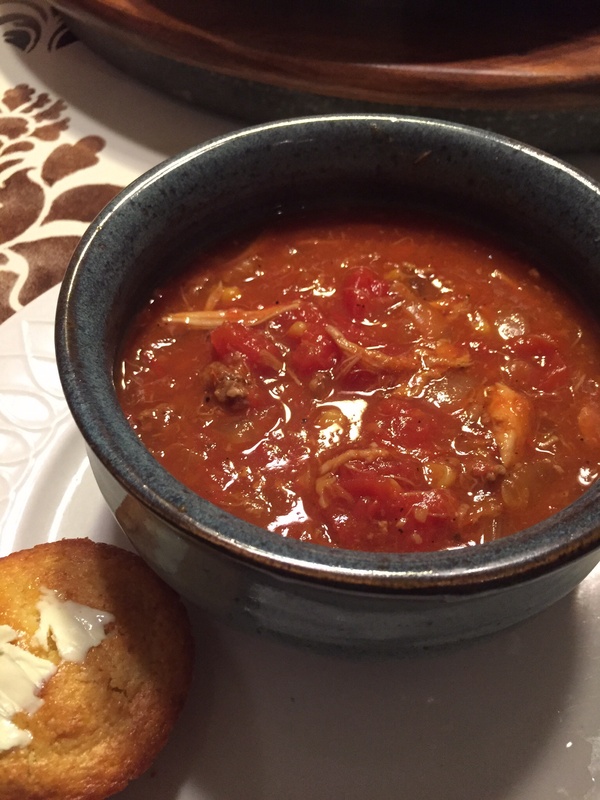 The first cool, cloudy day of autumn stirs an irresistible urge for Brunswick Stew–not just any Brunswick Stew, but Smokey Bones’ Brunswick Stew. The economic crash of the last decade (has it been that long?) took down our local Smokey Bones, though, so I’ve had to do my best to create an easy imitation. Perusing the web for same gave me some good ideas, but eventually I settled on my own, unique creation. This (my impromptu recipe) is a quicker and easier version than those I found online, but pleases my picky palette perfectly! 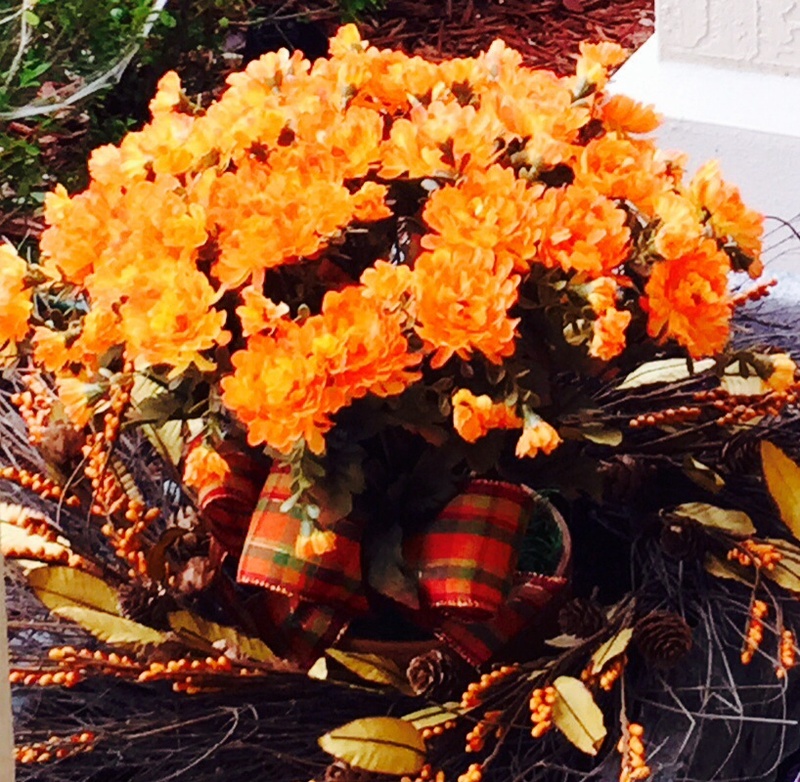 I’ve incorporated some ready-made items with brand names I found in my local Publix. I’d venture to guess it would be pretty tasty with your local brands too. I begin by browning the ground beef and sautéing onions while pulling the chicken from the bones. I unashamedly admit to opening a beer and helping myself to a few tastes (tastes, that’s all!) of that amazing Mojo chicken skin and the end of the wing during this process. You can’t really put that in a stew; someone’s got to eat it, right? Like the good Cherokee in my great-great grandmother, we honor the good spirit in all things by doing our best not to waste it! Too much, though, and it goes to my ‘waist’ instead. Then I start opening cans. I feel a bit like a 60’s mom during this part, but it’s for a good cause, I tell myself. We’ll get to the point where everything is fresh and organic–maybe even home-grown–someday. Like after retirement. By now the ground beef and onions should be ready to drain. Yes, get that grease outta there. There’s enough fat in the pre-packaged pulled pork to keep your body well-insulated for winter. Now this is where the fun begins! Turn up the music and dance a bit while you just plunk every ingredient into a nice large stew-pot, stir it up and bring it to where it just starts to try to jump out of the pot. Then cover, reduce heat to simmer, and get on with whatever else you want to do with your evening! You have anywhere from an hour to two, depending on your schedule. Just stop by and stir every 15 or 20 minutes so it doesn’t get a dark, stinky crust on the bottom. This will ruin it all! Save the stew! Stir it up! About a half an hour before dinner time, taste it and adjust seasonings if you feel you must. Then get started on the modified corn bread recipe I’ll be posting soon. Don’t forget your quick, fresh, organic salad prep on the side; you don’t want to skip your greens! Recommended pairings: What else? Your favorite beer or near-beer. Ginger ale for the totally abstinent. Let me know what you thought of this one. My family LOVES it! Our picky eater finally tries sautéed kale! It starts as a typical picky eater night at the table. She surveys her plate, eats her bread, nibbles her carrot, drinks some water and asks for more bread. A roasted chicken drumstick (chicken nuggets are sometimes acceptable, but this chicken on a stick, not so trusted), sautéed kale, carrots and bits of baked potato lay in their separate compartments on her pink plastic plate. Not exactly dinner heaven for this gal. Now, technically, there’s no excuse for feeding a four year-old. I mean, holding her fork, spearing each bite, bringing it to her mouth. I used to cringe when I saw parents do this for a child so obviously capable of feeding themselves. Understand, though, DAYS passed without the child eating anything green. So, when she asks, “Will you please feed me, Mimi?,” I cave. Her mother working evening shift, I seize the opportunity to work my magic. The magic never works as well when Mommy’s here. I suspect she doesn’t want her mother knowing she will eat green things. All Picky Eater usually needs to say is “I’m full, Mommy,” and Mommy clears the table. She even gives her a snack later–instead of sticking to her veggie-guns. Okay, so it’s fruit. You get the idea. Mimi, well, is a magic veggie-gun slinger, with master skills. Scooting our chairs close together, I slide in and enjoy the hug she offers. She loves being close. I sweetly (yet firmly) declare she will be trying at least a taste from each compartment. She has a choice which one first. To my surprise, she chooses kale! Wielding my good magic wand (which, mysteriously, looks just like her pink Minnie Mouse fork), I spear a little piece of the superfood and bring it to her mouth. It opens! Ahhh, Mimi magic is on tonight. To my delight, she likes it! She asks for more! She eats all the kale on her plate, and asks for more. She even accepts a bite of kale on top of a piece of chicken–six, maybe seven times–to get the chicken down. I am beside myself with joy. Yeah, I know, I probably care too much about getting vegetables into this little princess. In my celebration, I decide: This one is definitely a blog recipe. In large skillet, heat oil. 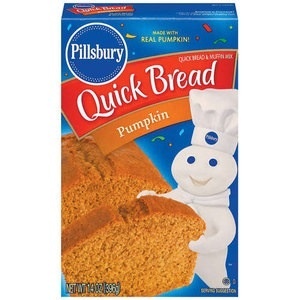 Add bread dip seasoning and stir, infusing the oil with this marvelous flavor. Did I mention that I love this stuff? Add kale and sauté over medium-high heat, stirring occasionally, 5 – 10 minutes, until wilted and soft. 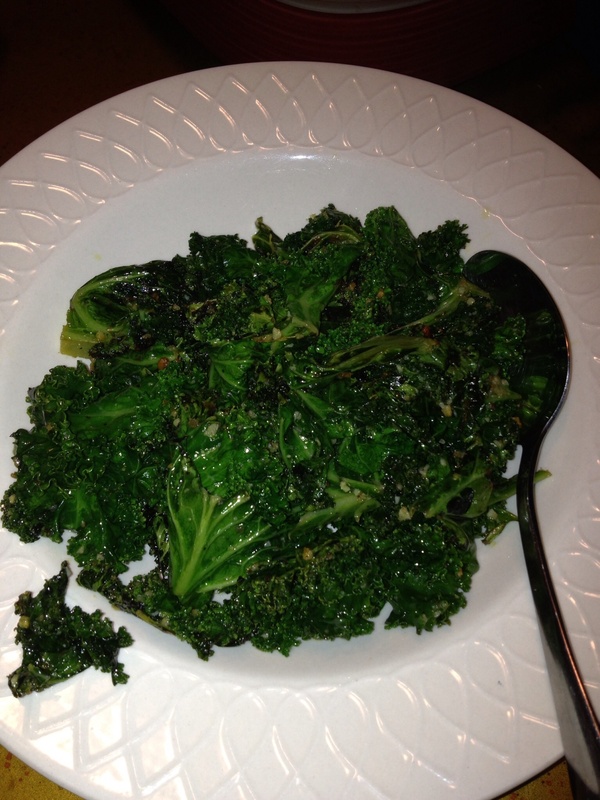 Squeeze lemon juice over kale, stir and cook another minute. Kale and Parmesan bread dip seasoning: me. As a baby, she devoured every food we offered, but as soon as she got a taste of sweet and salty, it was all over. Now she governs passage through those lips like Dora’s Grumpy Old Troll. In her case, though, there are three. Three riddles (challenges, that is) to solve, and I get over the bridge. We’ll never know if it tastes good to her until we get past the troll. 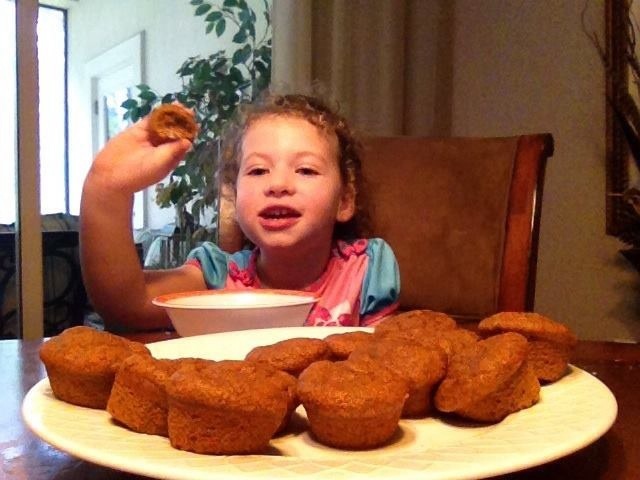 One day I discovered she likes pumpkin muffins (I lied a little and called them cupcakes). Three mini “cupcakes” later, she asked for more. My OT brain started churning. Food chaining is a practice I use regularly in my work as a pediatric occupational therapist. Now I also use my skills to help nourish my granddaughter. She’s a picky eater with mild hypo-sensitivity and a higher need for oral input than average. Mostly, though, she’s just a sweet and salty nut. First, how does this mystery food sound? Cupcake, not muffin. Yummy, not good for you. Second, how does it smell? Cinnamon passes. Sweet passes. Third, how does it look? Cake texture passes, with pumpkin color. 1/2 cup added sugar (yes, I know, but I have to start somewhere and gradually decrease to healthy). At least I use organic, raw sugar. 1/2 to 1 tsp pumpkin pie spice (I just threw some in there, sorry). Blend. Now you will see it is green. Green does not satisfy the Troll’s requirements. I added red food coloring. I know, not so great, but we can work on color chaining too. Gradually. 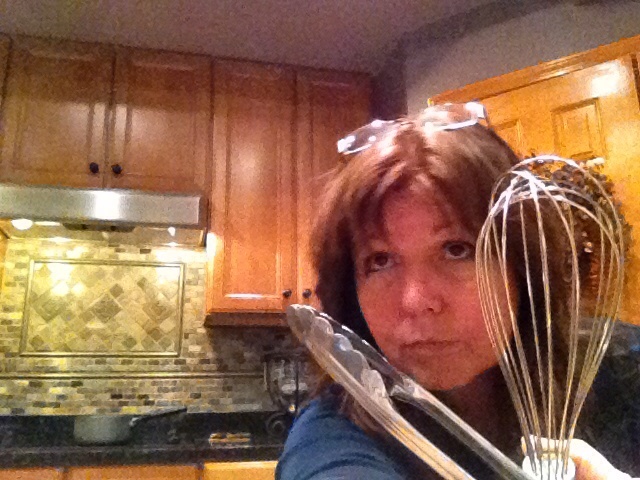 Now, turn this into the bowl with the cake mix to blend with a spoon until the flour mixture is wet. Spray your mini muffin tins or use liners. I usually use liners, they come with princesses or Dora, whatever pleases your Grumpy Old Troll. It makes them more believable as cupcakes. Bake as directed, but shorten the time (about half) for mini muffins. Check with a toothpick–they will be heavier than regular muffins, but the toothpick will still come out pretty clean when they’re ready. “One of these days, I’m going to teach you how to cook,” I offered, as playtime wound down and I begged off to go start dinner. “Okay, Mimi, what can I do?” my four-year-old granddaughter quickly returned. As she helped wash the kale, she surprised me as she spontaneously put a piece in her mouth to taste it. It didn’t make it past her palette, but I was impressed that she tried it. She’s a picky eater. Usually it takes rewards (AKA bribes), withholding her favored foods (AKA threats), and other such crazy antics to get her to try something new. “Don’t put it back in the bowl if you don’t like it, put it in that side of the sink.” She promptly took me up on the suggestion and spit it into the sink. Following her lead, I tried a piece, too, straight from the colander. Together, we agreed kale tastes pretty nasty by itself. “Well, it will taste much better once we get the dressing on it,” I reassured her, knowing full well she didn’t believe me. She remembered squeezing lemons for lemonade last summer. What a memory, I marveled. I wondered if neural pruning would snip that memory as she passes through this critical phase of brain development. All proceeded nicely with this process until she dropped the lemon into the juice, and, wouldn’t you know it? A drop of lemon juice splashed right in her eye. Several blood-curdling screams later, as we washed her eye and gave her a towel, she ran upstairs to change, apparently more mortified that her pirate outfit got wet than that her eye suffered a shockIng sting. 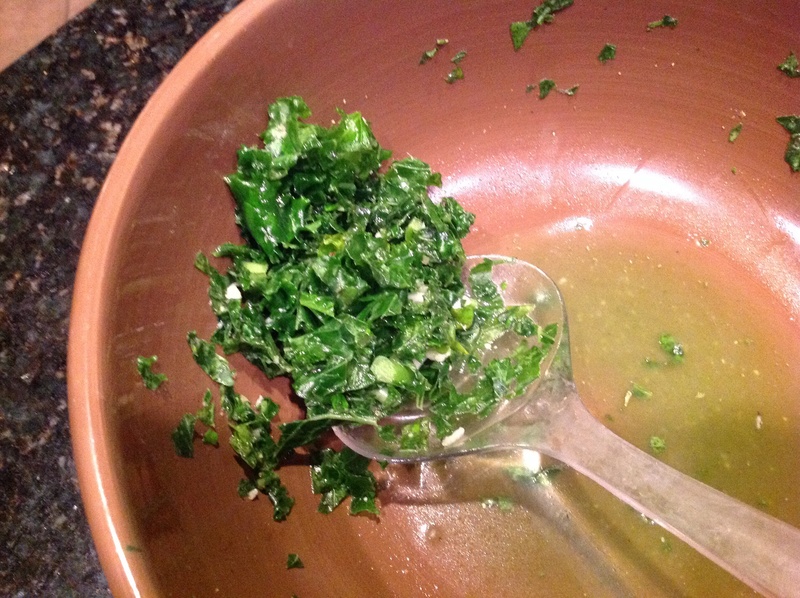 Assured she was fine, I peeled and diced the garlic, crushed it with salt using the end of tongs (the pestle is missing from our mortar and pestle), added the oil and lemon juice and tossed it into the diced kale. 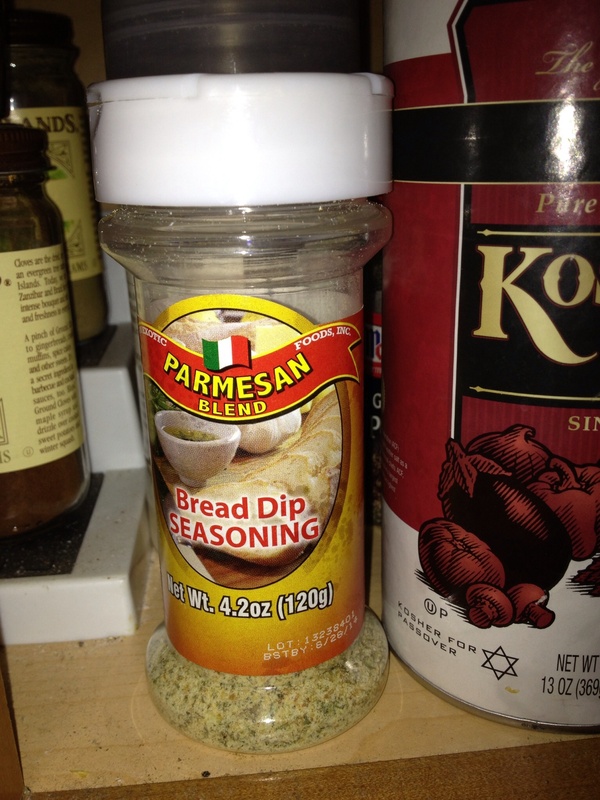 Adjusting for taste with a few dashes of bread dip seasoning made for a simple but powerful transformation. I could have added more to this simple salad, but for tonight, it was enough. Unfortunately, as anticipated, granddaughter wouldn’t try it again, so she didn’t get to experience the transformation from Yucky Kale to Super Kale salad. Instead we heard the usual, “I don’t like that!,” and it was a little more difficult for me to try persuading her with the old “You don’t know if you like it unless you try it” response. Here’s one from Christmas 2013 that I have been meaning to post. I apologize for lack of photo, next time I make them I’ll add one! This past Christmas, my sweetheart and I found ourselves having Christmas dinner alone. Did we feel lonely? Not particularly! We’ve been blessed with so many great family dinners, we chose instead to spend the evening enjoying each other’s company over a quiet dinner. This meal was enhanced by enjoying lamb rib chops that were the best we’d ever had. The amazing thing about them was that I made them, recipe and all! We both decided this is our new holiday specialty. 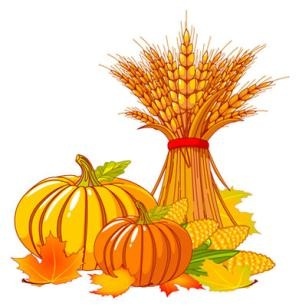 Family, be prepared, you will taste them at some point in the future! These are reminiscent of Garlic and Rosemary Lamb Chops in Cabernet Demi Glace that we had once at a Stonewood’s Restaurant, but could not find a recipe for, and they don’t seem to be on the menu anymore. They often serve their ribs with mint jelly, of which we are not big fans. Incorporate butter, then Half & Half, adjust seasoning to taste. These are great with garlic mashed potatoes and asparagus. Close enough to heaven for us. Enjoy! Hubby has a cold and really wanted a hearty chicken soup for dinner. It was late, we didn’t feel like driving 30 miles to Pollo Tropical for his favorite Caribbean Chicken Soup, so I searched the web for a recipe for same. Finding nothing, I decided to improvise. A quick trip to Publix and in about an hour we had a tasty soup, plenty for four very large bowls. The result: one happy hubby, one blogging wife, and now, you too, have the option to experience the pleasure! 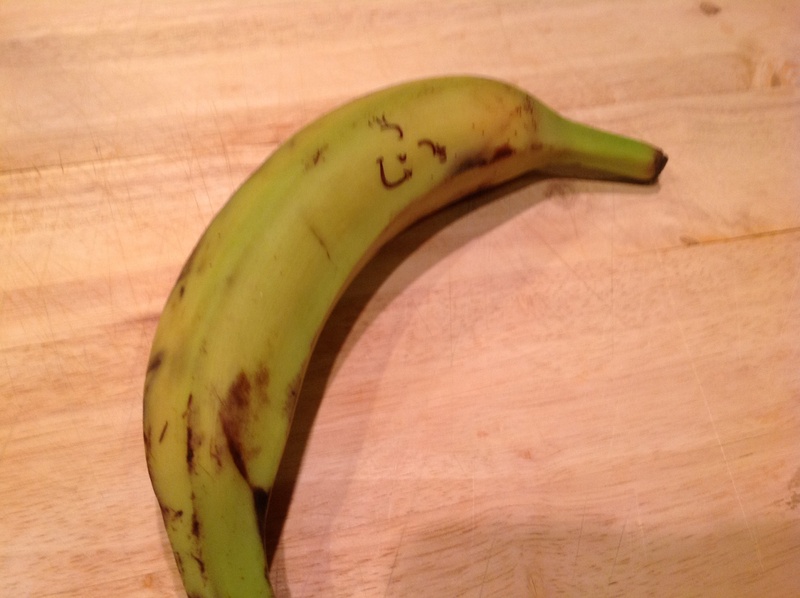 Happy Plantain, about this ripe! Keep soup at a lightly rolling boil, stirring occasionally. 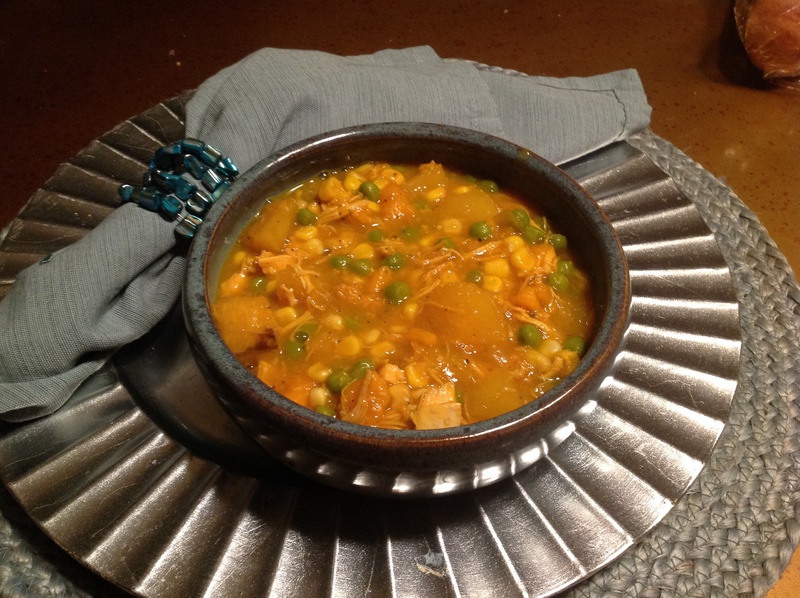 Ladle into soup bowls and serve with French or Cuban bread slices. Cures what ails ya.